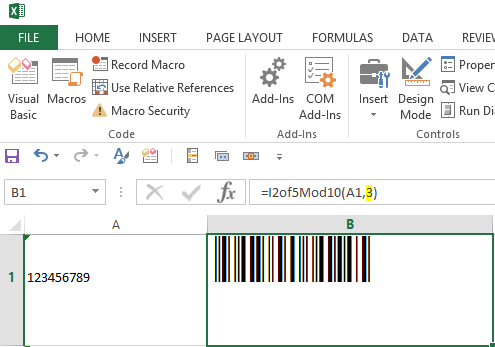 Update to the IDAutomationVBA.bas file free font encoder includes the ability to encode data for OPC (Optical Product Code). It is designed for marking retail optical products. OPC is also known as Vision Council of America OPC, VCA BarCode, VCA OPC. It uses the Interleaved 2 of 5 barcode symbology and encodes 9 total digits. The Manufacturer Identification Number, which is assigned by the Optical Product Code Council, is 5 digits and the Item Identification Number that is assigned and controlled by the optical manufacturer is 4 digits.